By WANT MORE INSPIRING, POSITIVE NEWS? SIGN UP FOR THE GOOD STUFF, A NEWSLETTER FOR THE GOOD IN LIFE. IT WILL BRIGHTEN YOUR INBOX EVERY SATURDAY MORNING. Miracle Messages helped Jasmine Cornett find her long-lost uncle Wayne. (CNN) - For years, Jasmine Cornett wandered the streets of San Francisco looking for her uncle Wayne, whom she hadn't seen since she was 12 years old. She often snapped photos of the homeless people she saw and sent them to her father and her aunt Lisa, asking if maybe this time she'd caught a glimpse of Wayne. Each time they texted back and said it wasn't him. Then one day in August, while sitting in her office, the recruiter got an e-mail with a short video from a nonprofit called Miracle Messages saying they had found her uncle. She immediately forwarded the video to her father and aunt. The unkempt man with a scraggly, gray beard had the right eyes. It's Wayne, her father said. Kevin Adler is the man behind Miracle Messages, the nonprofit that helped reunite Wayne and Jasmine. It has done the same for nearly 200 other families since December of 2014. Miracle Messages' premise is simple. Volunteers with the organization canvas city streets looking for homeless people and ask if there's someone to whom they'd like to address a short video message. Adler was inspired by growing up with his own uncle, named Mark, who also frequently experienced homelessness. And while completing his master's thesis in sociology at Cambridge University, he was able to reflect more deeply on how a breakdown in social bonds can ruin a life. He had witnessed it growing up, when Mark often came over for Thanksgiving dinner. Though Mark regularly experienced homelessness, he wasn't a "homeless person." He was family. Adler's organization was born at Christmas time in 2014, when he started walking down Market Street in San Francisco asking people who were homeless if they'd like to record a holiday message for a loved one. He was struck by how, perhaps even more than unemployment or mental illness, frayed social bonds were a primary driver of homelessness. Early on in his work, someone on the street told him, "I never realized I was homeless when I lost my housing, only when I lost my family and friends." Adler recognizes that the organization's best hope for true staying power and scalability lies in partnering with cities. Reuniting loved ones is just the spark for what inevitably becomes a long processs of rebuilding a shattered life or shattered family. Cities often hold the keys to getting struggling individuals into government-subsidized housing, mental health treatment, or substance abuse programs, and can work alongside family members who must keep holding their loved ones accountable. In San Francisco, Adler's group has partnered with the Union Square Business Improvement District on a pilot project. Officials working with the district saw how Miracle Messages helped Jasmine and Wayne and realized they could help dozens more in their area. Ten months ago, officials in Riverside, California, working on homelessness services also reached out to Adler to formally partner. "I hope the partnership is long term and there's no real end," said Emilio Ramirez, the city's deputy director of community and economic development. "Family unification is key, and an effective method of ending homelessness." In the past weeks Adler has been in Riverside helping train a volunteer group that will ultimately be spearheaded by a church in the area. 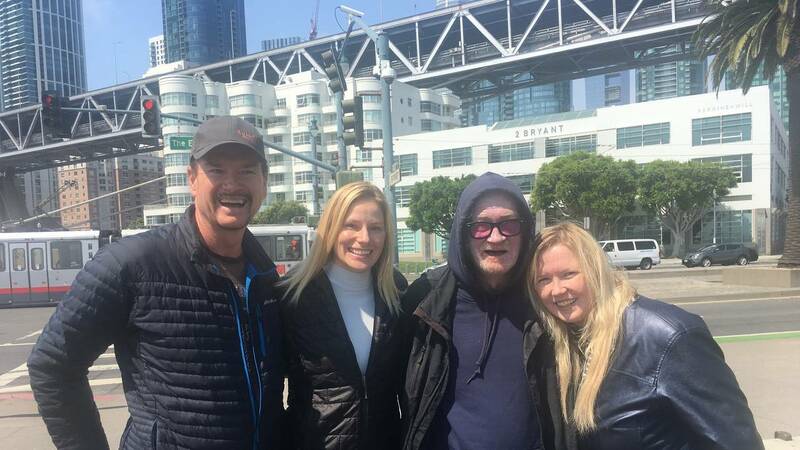 The Miracle Messages volunteers had told Jasmine that Wayne would be near the Powell Street BART Station, just off Union Square, and she felt "flush, white, and anxious," as she walked to find him. She embraced the man she hadn't lain eyes on in 18 years. Wayne is 67, and losing his hearing, but he recognized his niece. "Jazzy," was the first thing he said to her. Then: "I'm sorry." He repeated it again and again. "I'm sorry." Now, six months after their reunion, Jasmine says Wayne is staying indoors in a transitional living facility. That means he's been in a sober living situation for two months. He works out 3-5 times weekly at a nearby Planet Fitness. And last week he quit smoking. Jasmine has lunch with Wayne every Tuesday. Her brother has lunch with him every Thursday. And her aunt, 90 miles away, sees him every month. During his time on the street, Wayne was often in and out of jail. He used intravenous drugs and struggled with schizophrenia. He regularly committed petty crimes just to get a roof over his head and three meals a day. He told CNN he was glad Miracle Messages found him when they did, and that it was "good to reconnect with my family before time comes calling." But after nearly two decades spent in fight-or-flight mode, he still has a tough road ahead. For Wayne, reintegrating means learning tasks many of us take for granted, like simply using a cell phone.